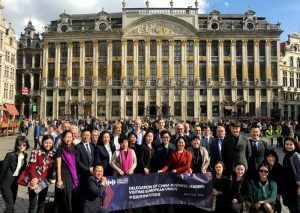 Macao (Macao SAR) – May 17, 2018 (travelindex.com) – Led by Ms. Pansy Ho, Secretary-General and Vice Chairman of the Global Tourism Economy Forum (“GTEF” or “the Forum”), the Delegation of China Business Leaders Visiting European Union (“Delegation”) recently completed an important mission in the EU. The objective of the mission was three-fold: to introduce GTEF to tourism stakeholders in the public and private sectors in the EU; to engage them in exchanges on tourism policy, business environment and investment opportunities; and to invite them to GTEF 2018, an official partner of the 2018 EU-China Tourism Year (“ECTY2018”), where the EU will be presented as the Partner Region and Guangdong Province as the Featured Chinese Province with a special focus on the Greater Bay Area. In Brussels, Belgium, the official seats of the European Commission (“EC”), Council of the European Union and European Council, as well as a seat of the European Parliament (“EP”), the Delegation visited the EP and met with Mr. Istvan Ujhelyi, Chairman of Tourism Task Force, EP; Mrs. Anna Athanasopoulou, Head of Unit Tourism, Emerging and Creative Industries, EC; Mr. Eric Philippart, Special Counsellor for the ECTY2018 and Director of Internal Market, Industry, Entrepreneurship and SME Department, EC; Mr. Eduardo Santander Executive Director and CEO, European Travel Commission (“ETC”); Mr. Bernard Tyttens, Secretary General of Belgian Travel Organization (BTO); Ms. Ilse Meyers, Secretary General of Association of Belgian Tour Operators (ABTO); Mr. Bernard Dewit, Chairman of Belgian-Chinese Chamber of Commerce (BCECC); Mr. Michel De Blust, Secretary General of The European Travel Agents’ and Tour Operators’ Association; and Mr. Tom Jenkins, Chief Executive Officer of European Tourism Association (ETOA). In The Hague, The Netherlands, the Delegation attended a lunch meeting with Mr. Frank Oostdam, President and Director of Dutch Association of Travel Agents and Tour Operators (ANVR); Mr. Jochum Haakma, Chairman of the EU China Business Council and former Dutch Consul General in Hong Kong and Shanghai; and Mr. Henri Remmers, Founder and Director of Corpus Museum in Leiden. The Delegation later visited the world-renowned Hotelschool The Hague where Ms. Regine von Stieglitz, President of Board of Directors, gave a brief introduction of the school’s curriculum, followed by group discussion of topics like hospitality training and education, as well as facilitation of EU-China tourism cooperation through educational means. The visit in The Hague concluded with a tour of the headquarters of citizenM, a pioneer of innovative hospitality experience for millennial travelers, where the Delegation learned about the hotel’s project development and operation. The Delegation then travelled to Amsterdam and joined a guided tour at Rijksmuseum conducted by Mr. Taco Dibbits, General Director of Collections, on the museum’s history, development and collections. In Vienna, Austria, the Delegation met with Dr. Angelika Liedler, Head of International Tourism Affairs of Federal Ministry of Digital and Economic Affairs of Austria; Dr. Petra Stolba, Director General of Austria National Tourist Office; Mr. Norbert Kettner, Chief Executive Officer of Vienna Tourist Board; Mr. Christoph Plank, Head of Tourism of Advantage Austria of Austrian Federal Economic Chamber (WKO); Ms. Julia Mauk, Expert of International Tourism Affairs Division of Ministry of Sustainability and Tourism; and Mr. Karl Wöber, President of University Board of Modul University and tourism expert. The Delegation later experienced Austria’s diversified cultural and tourism offerings through visits to the prominent Spanische Hofreitschule, the centuries-old Hotel Sacher, a concert of masterful music by Mozart and Strauss at Schonbrunn Palace Orangery, and Swarovski Kristallwelten at Innsbruck. In addition, the Delegation paid courtesy calls on Chinese ambassadors in the EU countries visited. Mr. Zhang Ming, Ambassador, Head of the China Mission to the EU; Mr. Wang Hongjian, Minister of the Chinese Mission to EU; Mr. Wu Ken, Ambassador of China to the Netherlands; and Mr. Li Xiaosi, Ambassador of China to Austria, received the Delegation and generously shared the latest news and updates on tourism, cultural and economic relations between China and the respective EU member states. Co-organized by GTEF, China Chamber of Tourism and China Women’s Chamber of Commerce, the 17-member strong delegation was led by Ms. Pansy Ho, and comprised influential Chinese business leaders in various sectors of tourism economy and key Forum members including Mr. Jean Claude Baumgarten, Vice Chairman of GTEF; Ms. Wang Ping, Chairman of China Chamber of Tourism (“CCT”) and Vice Chairman of GTEF; Ms. Liu Ting, Chairman of China Women’s Chamber of Commerce; Ms. Chen Shiyou, Vice Chairman of CCT and Managing Director of China International Capital Corporation Limited; Ms. Zhong Fei, Vice Chairman of CCT and President of Hunan Huaxia Investment Group and Ms. Li Xiaomei, Delegate of Vice Chairman of CCT and Chairman and General Manager of Mekong Tourism Co. Ltd.
As a partner event of ECTY 2018, GTEF is a perfect platform to bring two of the world’s most vibrant economies, EU and Guangdong Province, together to advance economic, cultural and people-to-people exchanges through tourism. Set to be held at MGM COTAI on October 23 and 24 under the theme “Strategic Partnership in a New Era, Rising Momentum for a Shared Future”, GTEF 2018 will explore how the EU, the second-most popular destination for outbound Chinese tourists outside Asia in 2017, and the GBA, which will be the seventh largest economic bloc in the world, can combine their collective effort to create a new catalyst for global economy. GTEF will also offer tourism promotion, investment and cooperation opportunities through bilateral trade meetings, business matching, networking, workshops, exhibitions, etc.